Upload, edit, share, and synchronize documents with your team in the office or on the road. Create a cloud-based collaboration point to organize and share content, schedules, and team conversations online. Manage projects and review progress wherever your mobile devices take you. PBworks lets your team capture knowledge, share files, and manage projects. 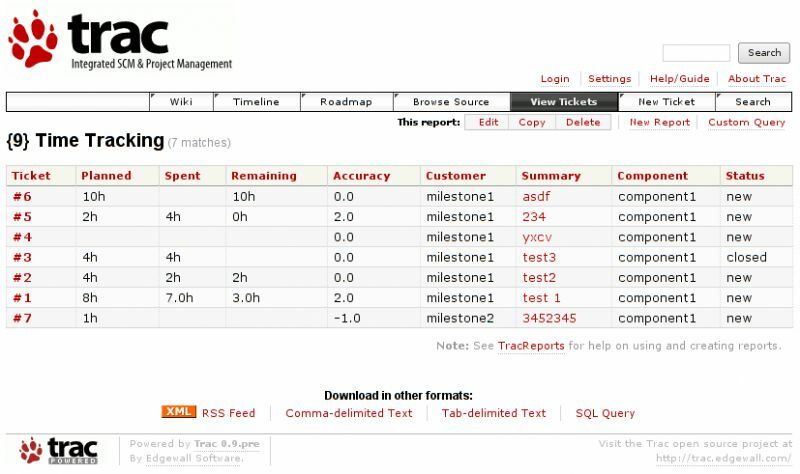 It tracks every change, and automatically notifies you and your team to keep everyone in the loop. 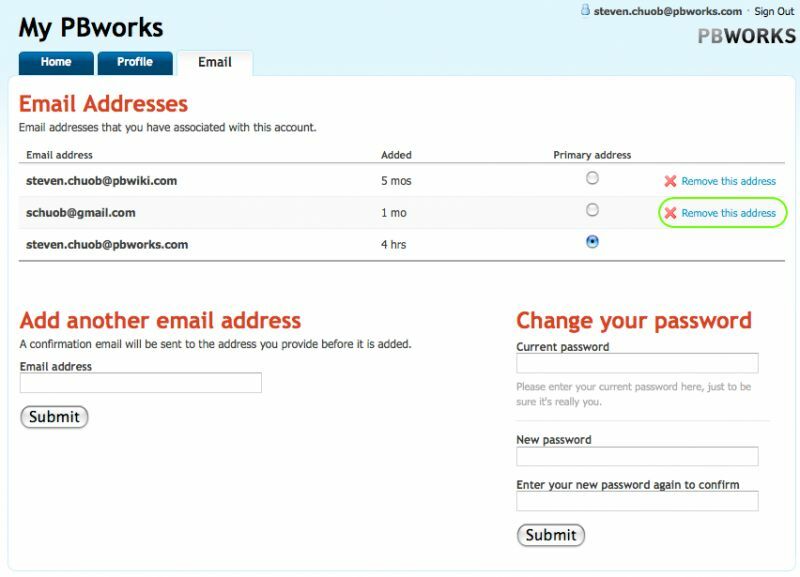 PBworks is secure, reliable, and accessible from any computer or mobile device, so your team can use it anywhere they go. You can even use it with clients or partners. And because it's hosted, you don't need to download any software or manage any servers. Whatever you're working on, you can customize PBworks to make your team more productive. 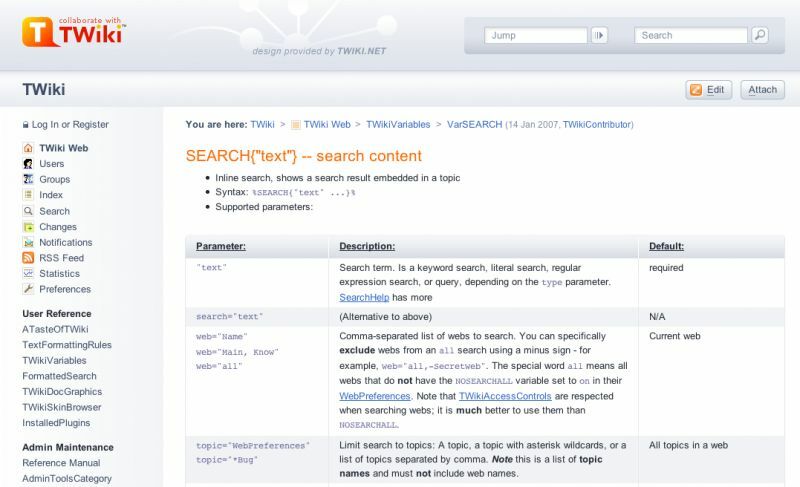 TWiki is a flexible, powerful, and easy to use enterprise wiki, enterprise collaboration platform, and web application platform. It is a Structured Wiki, typically used to run a project development space, a document management system, a knowledge base, or any other groupware tool, on an intranet, extranet or the Internet. 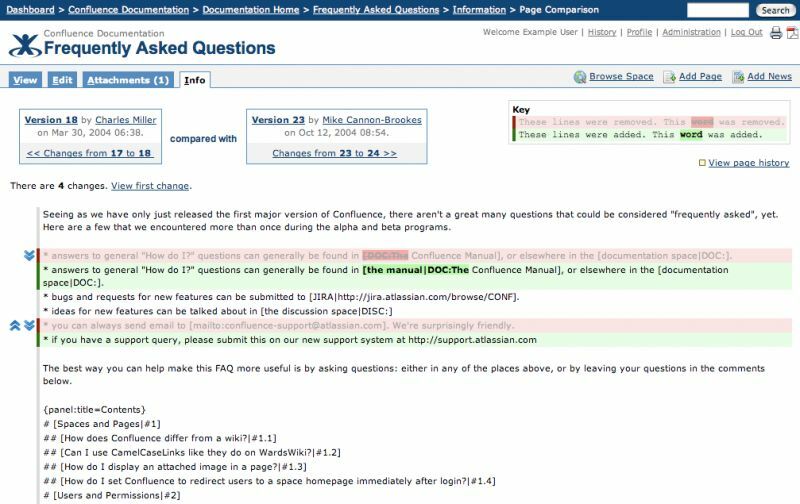 SamePage is the enterprise-strength wiki solution that combines the best of wikis and blogs to effectively support, streamline, and manage collaborative team efforts. Our solution provides a wiki SamePageenvironment for teams to work together more effectively, making collaboration, communication, and sharing knowledge across project and geographies easier than ever. SamePage taps into the collective knowledge of the organization, taking full advantage of the vast network of social and organizational connections to leverage the value of collaborative work and turn it into real business results. The XWiki project offers both a generic platform for developing collaborative applications using the wiki paradigm and products developed on top of it. 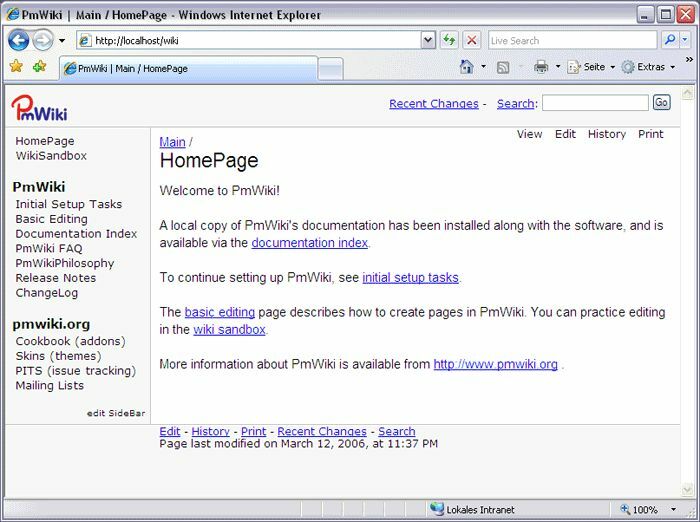 All XWiki software is developed in Java and under the LGPL open source license. Tiki is the Free/Libre/Open Source Web Application with the most built-in features. So whatever feature you can imagine running in your browser window, chances are Tiki does it. Knowledge base: Wiki, FAQs, File gallery, Photo Album, Tags, Search, Kaltura video management integration, etc. Collaboration/Project Management: Wiki, Forums, Tasks, Permissions, Timeline, Proposals/Votes, Blog, Categories, Watch, etc. 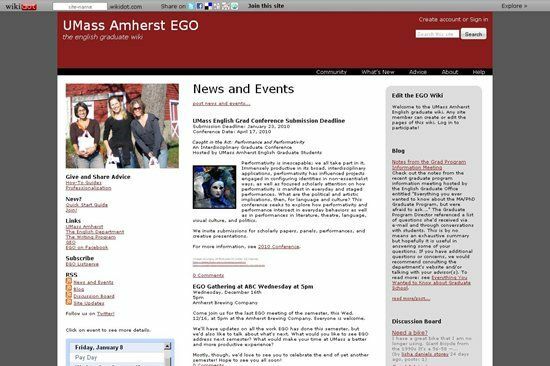 Publishing/web site: News articles, Blog, RSS, Newsletter, Maps, Themes, Banners, WYSIWYG, SEO, etc. 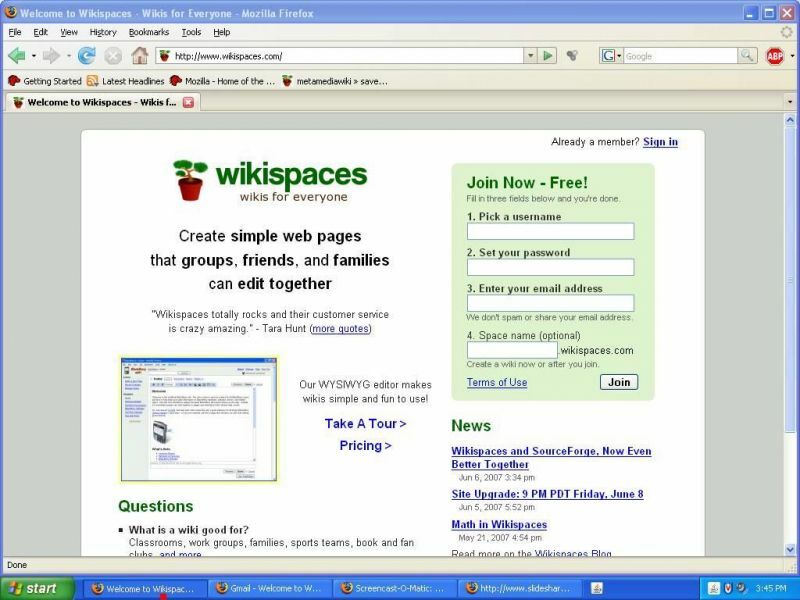 Wikispaces is a hosting service (sometimes called a wiki farm). Private wikis with advanced features for businesses, non-profits and educators are available for an annual fee. DocuWiki started as an offspring of the MVGroup documentary forum in order to make the contents easier to find and index as well as browsing web pages. 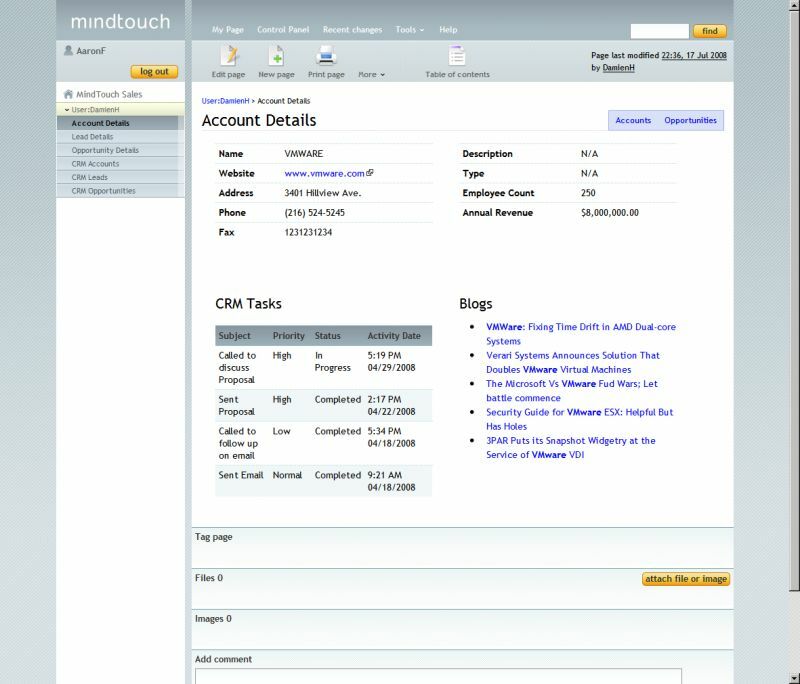 MindTouch, a cloud service that helps customers find answers to product questions using the company’s existing documentation, training materials and customer service documents, announced $12 million in funding after years of bootstrapping. What they do is take a company’s existing documentation and other materials and put it to work online where customers can access it and use it. They do this by breaking the content into small chunks and extracting metadata to make it searchable online. They then combine that with machine learning to organize logical learning paths through the materials. The end result is that it makes it easier for customers to search for and find the information they need without having to call customer service. For those businesses that still don't realize that the great majority of their customers coming (or would like to come) to their site via smartphones, Google launched the new initiative GoMo. This service allows you to see how your site looking in the mobile browser and find an appropriate service for building mobile site version (Google Sites is also in the list). Who should think about the mobile site version? First of all, it's online stores. Because browsing stores on a smartphone - is the most popular activity among those sitting in a toilet. Second, that are local businesses: cafes, restaurants, hotels, shops, medical services, hair salons, car repair ... - all the things that city visitor or local inhabitant may need. In addition to mobile site, local businesses should also care about presence on online maps (such as Google Places) and GPS-enabled local-services (such as Foursquare, Google Offers). And of course, do not forget about mobile Adwords advertising, which will attract people searching something related to your business on a smartphone. Atlassian has launched the new SaaS service Atlassian OnDemand, which includes its popular tools for managing software development projects: JIRA (issue-tracker), Confluence (wiki), GreenHopper (Agile Project Management), Bonfire (bug reporter), FishEye (code manager), Crucible (code review) and Bamboo (integration). 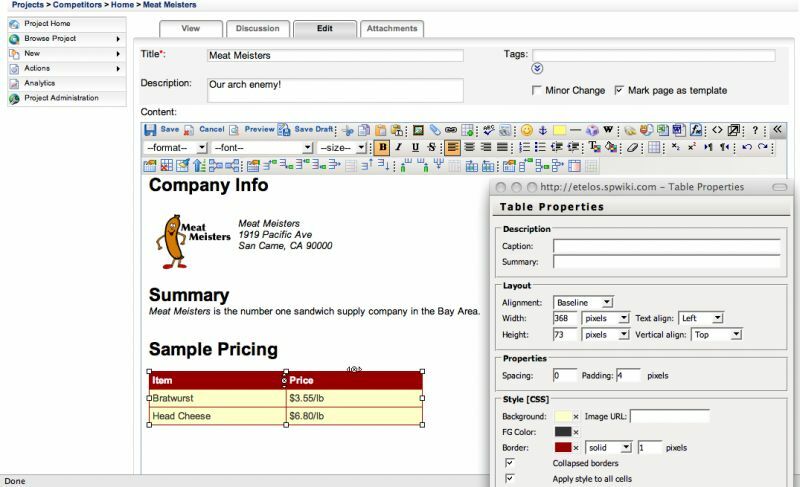 All products in the SaaS version provide the full functionality of the installable counterparts. 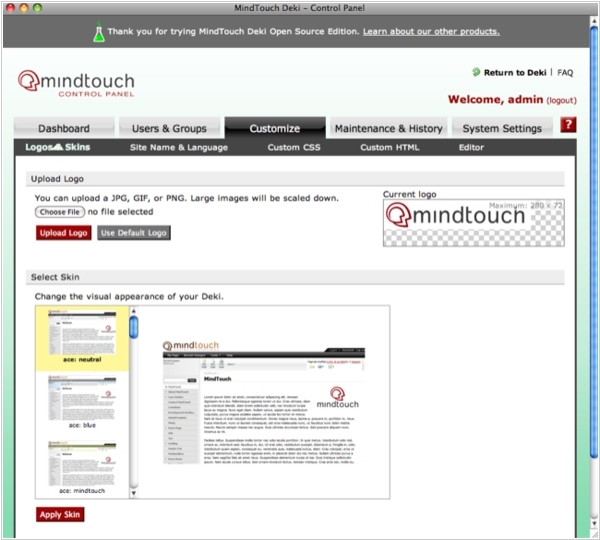 There are only minimal restrictions on the tool integration and use of the custom plug-ins. You can turn on/off the tools as needed. The service pricing is traditional for Atlassian - "everything for $10 for 10 users." Recall that the company is also selling the 10-user leniences of the same installable products for $10. So you can either buy the product for $10, or rent it for $10/month. At first glance this pricing is very strange. But in any case, $10/month - is a small price even for a startup. Besides, the system support, scaling and upgrades are performed by the provider. In addition, in the case of remote software development project, you anyway need to host the project somewhere. And Atlassian doesn't set the limits on bandwidth and disk space. 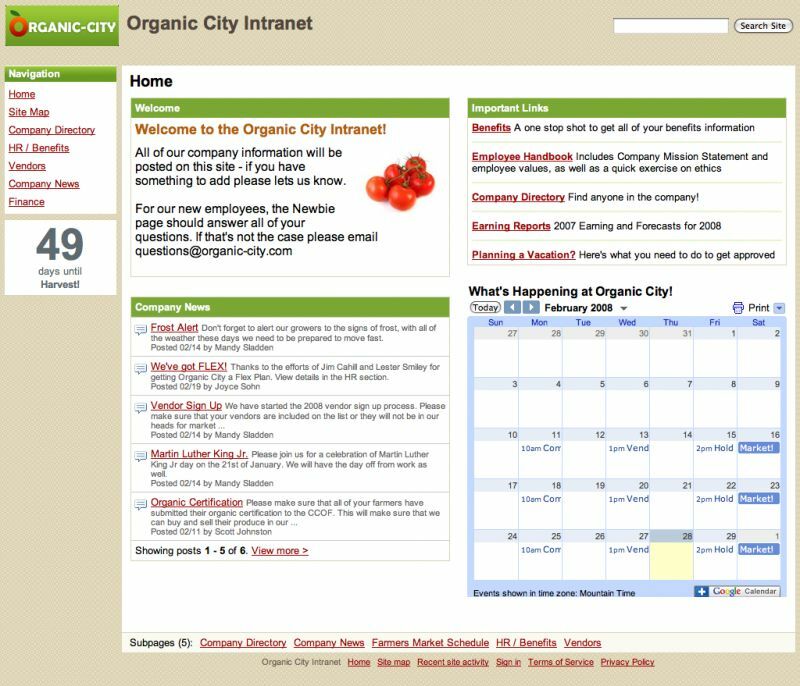 Late last year, Cisco introduced the social intranet system with a long name Cisco Enterprise Collaboration Platform and this solution hit the Top 10 Enterprise 2.0 products in 2009 by ReadWriteWeb. Now Cisco starts selling the system under the new name - Cisco Quad. 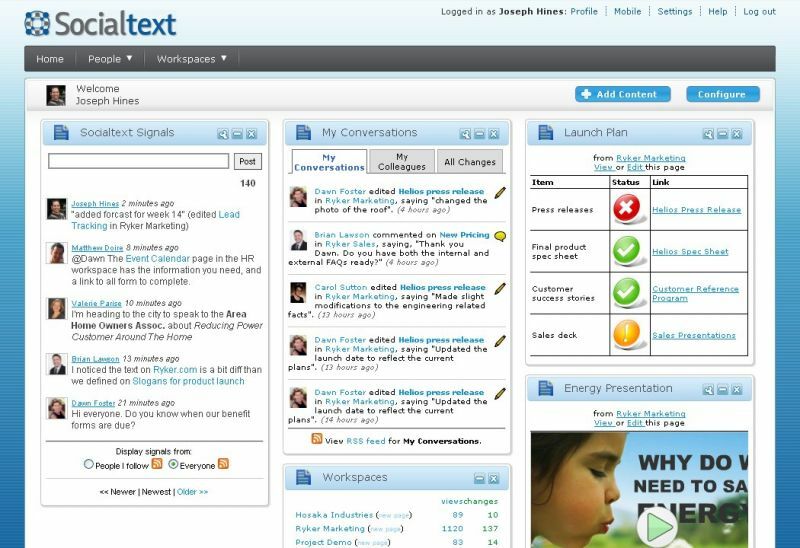 The functionality of the system at first glance seems to be traditional for enterprise social software: user profiles, personal start pages, microblogs and communities (for group collaboration). But of course, Cisco added to the system its main feature - video. From anywhere in the system, where user's avatar appears, you can see his online status, send him an instant message or start a video conference. And, of course, Cisco Quad is closely integrated with Cisco Webex web conferencing service and Cisco Unified Communications . The system can be installed on the own server or on a public cloud platform. And all that it's user need - is a web browser and a webcam. In the near future the iPhone / iPad apps will appear. Of course, the system fits the enterprise administration, security and safety requirements. Another difference of this system could be the support for all popular content management systems - EMC Documentum, SharePoint, Salesforce and Oracle. 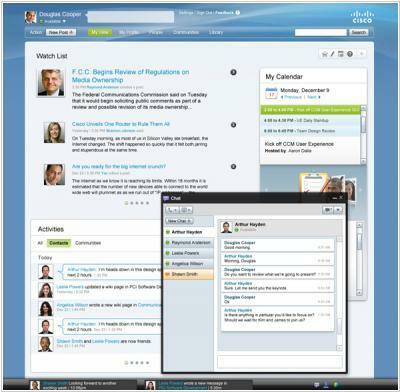 Cisco Quad main competitors on the enterprise social software market are Microsoft Sharepoint, Google Apps and IBM Lotus Connections. Although Zoho is positioned as a SaaS vendor for small business, it doesn't forget about the enterprise customers. The new features in Zoho Wiki 2.0 primarily target large companies. 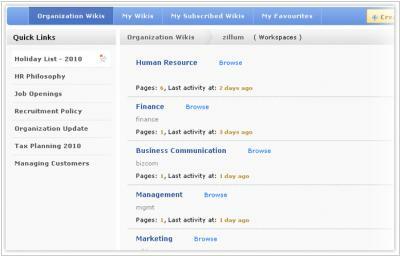 First of all, that are workspaces, which are useful for creating separate wikis for company departments. Each workspace has its own administration panel, security settings and appearance (customizable at CSS level). The access control system (which is also actual for large companies) was dramatically improved. Now you can set the detailed access rights at page, workspace or wiki level for employees, user groups, domains or customers. 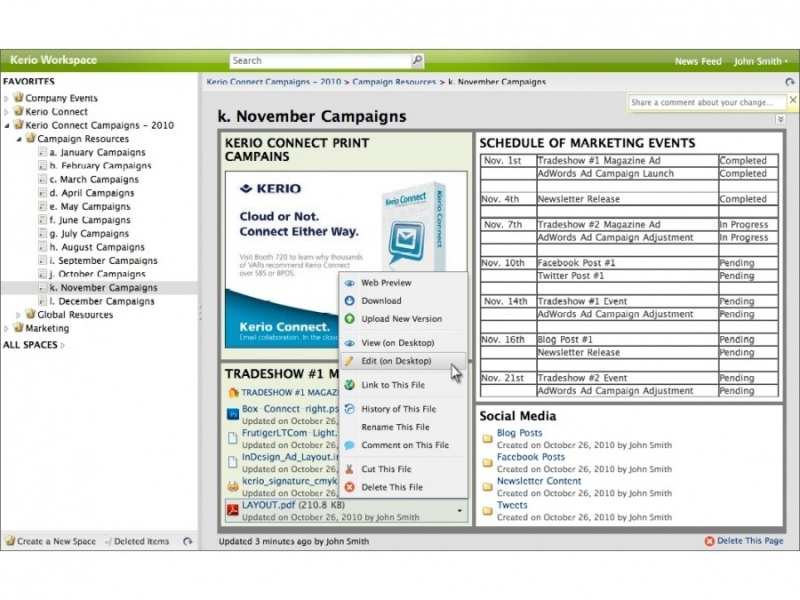 In addition, now you can create not only text pages, but also file cabinets and dashboards. In the File Cabinet you can download files from your computer or from the Google Docs. Documents can be opened and edited online in Zoho editors. In the Dashboard you can insert various widgets, like in iGoogle. In addition to email-notifications now you can subscribe to changes by RSS. Zoho Wiki provides a free version for 3 users (limited to 2 workspaces and 50 MB of space). For $8/month you can buy an additional user, and for $ 5/month - additional wiki. Besides, if you pay, you can use the wiki on your own domain.